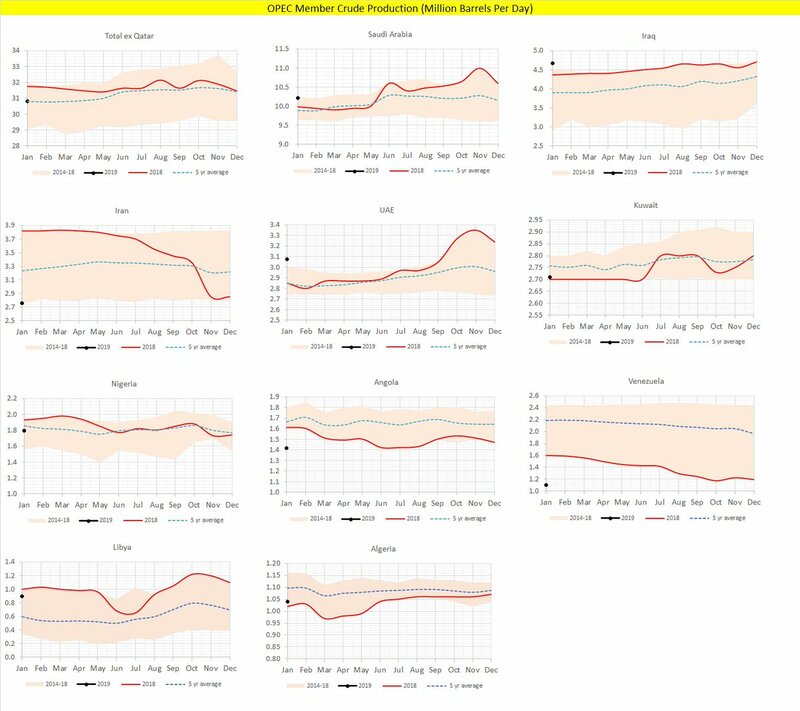 The OPEC Monthly Oil Market Report (MOMR) for February released Tuesday provides OPEC's outlook for crude oil market developments for the coming year with key developments impacting oil market trends in world oil demand and supply. In 2018, the estimate for world oil demand growth revised lower by a slight 0.03 mb/d from last month’s report. Slower than expected demand growth from OECD-Europe and Asia Pacific as well as from non-OECD Other Asia and the Middle East. Total world oil demand growth in 2018 is estimated at 1.47 mb/d, for an average of 98.78 mb/d for the year. For 2019, oil demand growth is forecast at around 1.24 mb/d, under previous month’s by 0.05 mb/d to reach an average of 100.00 mb/d. The downward revision is mainly an outcome of lower economic expectations in 2019 for the OECD Americas and Europe, as well as Latin America and the Middle East. Non-OPEC oil supply growth in 2018 revised up by 0.11 mb/d from the previous month’s report, mainly due to adjustments for US, Canada, Malaysia, China and UK supply, now estimated at 2.72 mb/d, with total supply averaging 62.17 mb/d for the year. Key growth drivers in 2018 were the US with 2.24 mb/d, along with Canada, Russia, Kazakhstan, Qatar, Ghana and the UK, while Mexico, Norway and Vietnam showed the largest declines. The non-OPEC oil supply growth forecast for 2019 was also revised up by 0.08 mb/d to 2.18 mb/d, mainly due to a revised production forecast for the US Gulf of Mexico. Demand for OPEC crude in 2018 stood at 31.6 mb/d, 1.3 mb/d lower than the 2017 level. In 2019, demand for OPEC crude is forecast at 30.6 mb/d, around 1.0 mb/d lower than the 2018 level. The OPEC Reference Basket (ORB) rebounded in January, gaining more than 3%, or $1.80 month-onmonth (m-o-m), to average $58.74/b. Crude oil prices improved over the month, buoyed by robust market fundamentals with signs of tightening crude supply as well as firm crude oil demand, particularly from AsiaPacific. In January, ICE Brent was on average higher by $2.57, or 4.4%, m-o-m at $60.24/b, while NYMEX WTI rose m-o-m by $2.57, or 5.2%, to average $51.55/b. The Brent contango structure flattened as the market moved toward balance, while the WTI structure remained in significant contango, reflecting US market fundamentals. The DME Oman forward curve remained in backwardation. In 2018, the estimate for world oil demand growth was revised lower by a slight 0.03 mb/d from last month’s report. This came as a result of slower than expected demand growth from OECD-Europe and Asia Pacific as well as from non-OECD Other Asia and the Middle East. Total world oil demand growth in 2018 is estimated at 1.47 mb/d, for an average of 98.78 mb/d for the year. For 2019, oil demand growth is forecast at around 1.24 mb/d, slightly lower than the previous month’s assessment by 0.05 mb/d to reach an average of 100.00 mb/d. The downward revision is mainly an outcome of lower economic expectations in 2019 for the OECD Americas and Europe, as well as Latin America and the Middle East. Non-OPEC oil supply growth in 2018 was revised up by 0.11 mb/d from the previous month’s report, mainly due to adjustments for US, Canada, Malaysia, China and UK supply, and is now estimated at 2.72 mb/d, with total supply averaging 62.17 mb/d for the year. Key growth drivers in 2018 were the US with 2.24 mb/d, along with Canada, Russia, Kazakhstan, Qatar, Ghana and the UK, while Mexico, Norway and Vietnam showed the largest declines. The non-OPEC oil supply growth forecast for 2019 was also revised up by 0.08 mb/d to 2.18 mb/d, mainly due to a revised production forecast for the US Gulf of Mexico. Global product markets continued to lose ground in January for the second consecutive month. In the US, soaring gasoline stocks, along with poor fuel oil performance affected by lower FCC margins, offset support from strong heating oil demand. In Europe, product markets weakened across the barrel as arbitrage openings into the region pressured margins and outweighed support from a pick-up in diesel and fuel oil demand. In Asia, weakening naphtha and jet/kerosene markets dragged on margins, as a growing gasoline surplus reduced gasoline margins to a new multi-year low.